Emus aren’t, by nature, guardian animals. They’re actually pretty skittish and, if you want them to guard a herd, they need a proper introduction. Emus are very social animals, but they need to learn who is part of their flock, so they’ll know who isn’t. Gatsby and Kelvin have been running-off anything that comes into the yard, such that we can’t always tell if they’re being nasty, or just overly-friendly. Sometimes, it’s hard to know the difference. 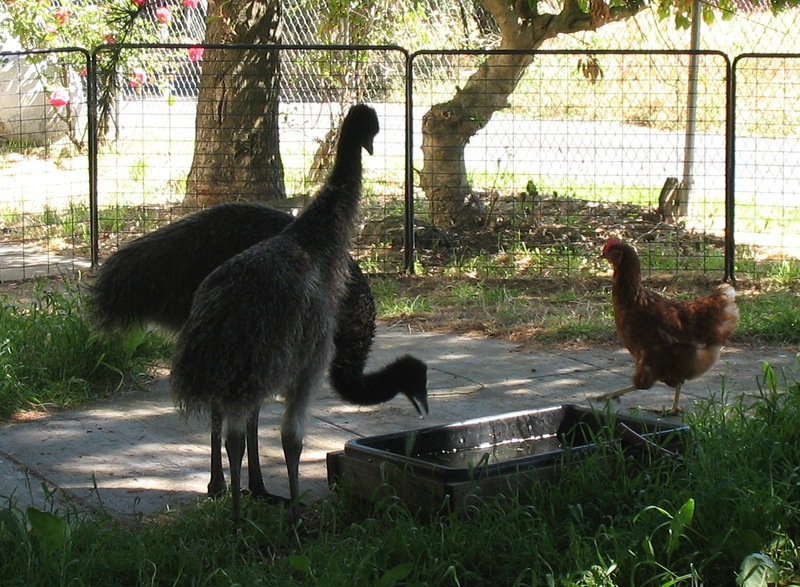 And so it is with the emus, they are very comfortable around us, and most of our friends. So, we thought that they were generally, friendly emus. And, well they are, but only within their comfort zone. When strangers come by, they can be a little nervous, and potentially dangerous. That’s the good news… and the bad news, about emus. If they know you, you’re family. If they don’t know you—you are a potential enemy. As we’ve said before—they’re not real bright. It’s kind of a binary system, they’re either on, or off. If an emu is afraid, then you need to be a little afraid. You need to pay close attention if they start to hiss or huff. Because, not far behind that, is an instinctive, and potentially devastating, kick. It’s not just with people. The emus are comfortable with our cats; they grew up with them. But they clearly make the distinction between ours and the feral cats from the dairy, next door. Those cats get run off (I suspect with some glee.) It occurred to me recently (when a visitor earned himself a solid hiss) that our emus needed finishing school, so to speak. So, we decided to start small. 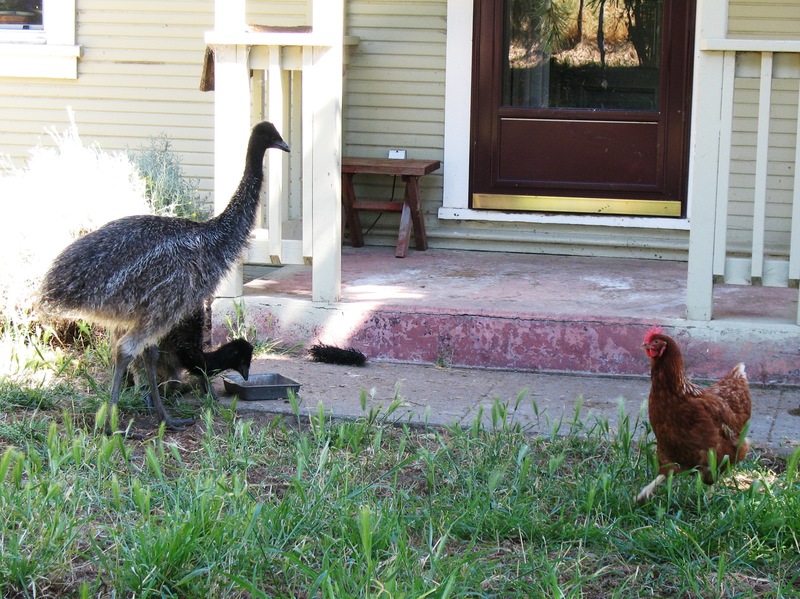 Since there is the possibility that the emus may be guarding chickens, it was a small enough place to start. First, we put an empty cage in the yard, for a few days—that garnered some interest—and soon enough, it became part of the landscape. Then, two days ago, we dropped a couple of chickens into the cage. The emus were wary, to say the least. They scooted around, wide-eyed at the new arrivals’ cackling. 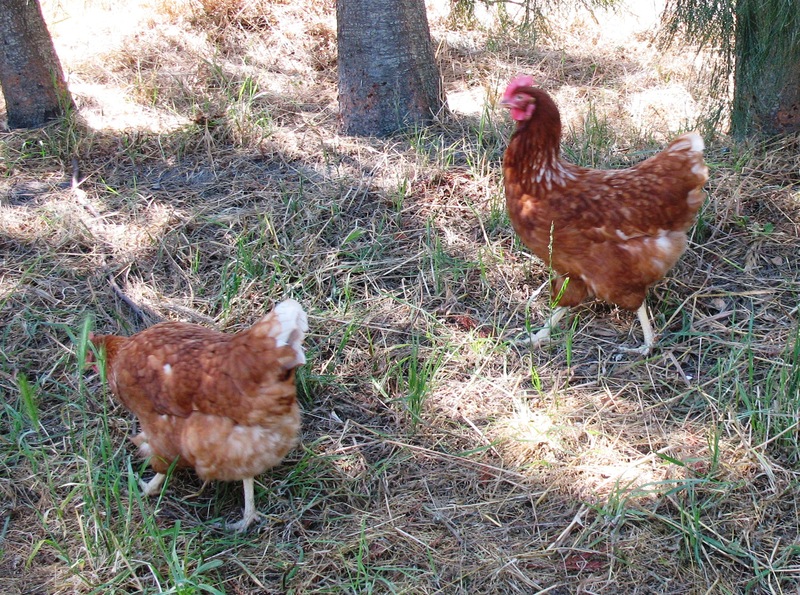 (They do seem to be particularly noisy chickens.) We gave it an overnight, and the following day, we opened the cage. Now, these emus are teenagers. They’re not yet full sized, but they’re a lot bigger than a chicken. But when it comes to new experiences, they’re still just babies. The emus headed to the far side of the yard. Then, after watching from afar, they slowly inched closer to size-up the new invaders. The chickens are full-gown and about as bright as… well, chickens. They, in contrast, are totally nonplussed by the emus. The emus alternate between being cool about chickens, and being spooked. They walk around like it’s no big deal, but if a chicken corners them, Kelvin, in particular, reacts like her life is at risk. Even though she’s the bigger of the two, she is also the most jumpy. (Boy, does she take after her mother, or what?) For his part, after an initial nervous phase, Gatsby invited a chicken to “dance” (doing the characteristic, emu drop and roll.) The chicken was non-responsive—clearly ignorant of the emu rituals of engagement. I can only hope that the emus aren’t put-off. They’ve managed to share food dishes and yard without serious incident. So far, we’re calling it a success, in a measured sort of way. Clearly, it’s a good thing we recognized the need for this. These emus have some manners to learn before they head out into the world to take on their security work. We don’t want to raise thugs, after all. We’ll start here, quietly with chickens and, in a week or so, we’ll trade up to goats. Goats, you ask? Well, Elmer has a couple of goats that were left behind by tenants (this is typical, Elmer) and they’d be perfect for hardening off a couple of flappable, emu trainees. In a few weeks, maybe they’ll be ready for sheep. 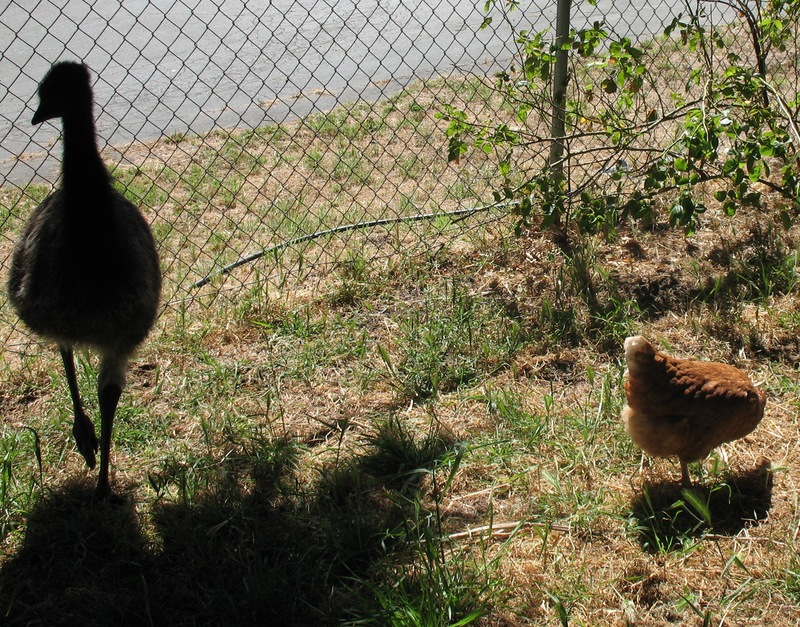 Rick nods to Elmer, noting that we have two cats, two emus, now, two chickens and soon, two goats. He says that if we start building a boat, anytime soon, people should pay attention to the sky. I really never thought I’d end up as the emu lady. Thank god for the internet.